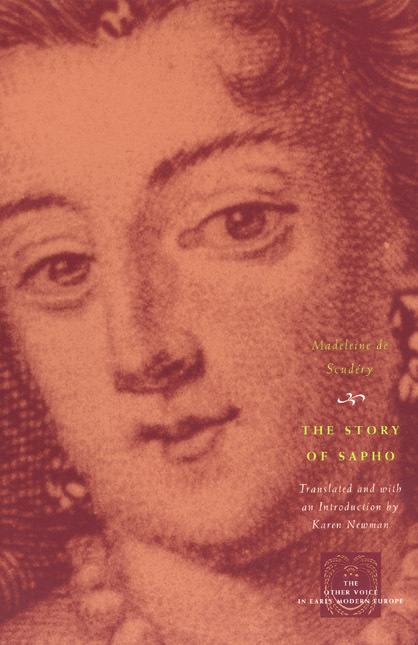 Ridiculed for her Saturday salon, her long romance novels, and her protofeminist ideas, Madeleine de Scudéry (1607-1701) has not been treated kindly by the literary establishment. Yet her multivolume novels were popular bestsellers in her time, translated almost immediately into English, German, Italian, Spanish, and even Arabic. The Story of Sapho makes available for the first time in modern English a self-contained section from Scudéry’s novel Artamène ou le Grand Cyrus, best known today as the favored reading material of the would-be salonnières that Molière satirized in Les précieuses ridicules. The Story tells of Sapho, a woman writer modeled on the Greek Sappho, who deems marriage slavery. Interspersed in the love story of Sapho and Phaon are a series of conversations like those that took place in Scudéry’s own salon in which Sapho and her circle discuss the nature of love, the education of women, writing, and right conduct. This edition also includes a translation of an oration, or harangue, of Scudéry’s in which Sapho extols the talents and abilities of women in order to persuade them to write.